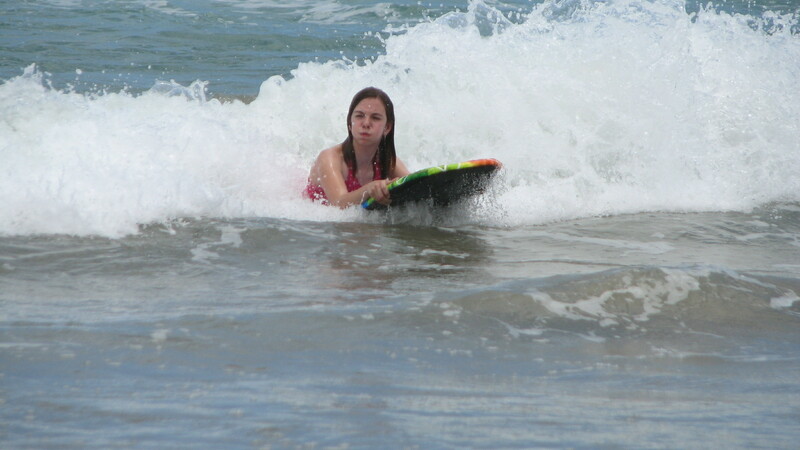 We have spent a lot of time in Florida and my daughter whenever possible has spent hours on a little boogie board. If it’s water she is in it and trying to ride the waves. We spent $8 on a boogie board for the weekend from Wal-Mart. This was $8 well spent! She spent hours on Friday in the water, and then Saturday night, and then Monday afternoon. It owed us nothing! At the end of our trip on the way to the airport we gifted it on to another young girl who looked very excited to have it. Knowing how much my daughter loved the water we found South Padre Surf Company. They offered either a 1 hour class at $40 or a 3 hours surf camp at $80. Talking it over with my husband we agreed to sign her up for the 3 hour. We figured by the time she mastered it the hour would almost be over, so why not do the camp? We arrived at Isla Blanca Beach Park promptly at 7:45 to meet up with the other surf campers. The group was 4 adults and 3 kids for this day. 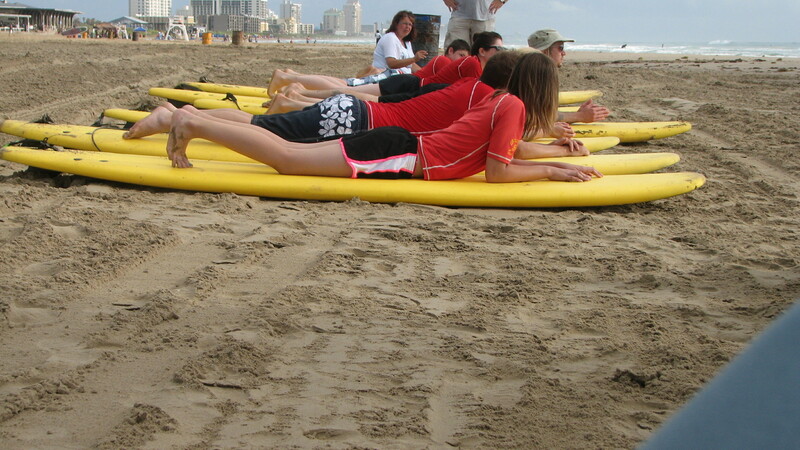 Each person is assigned a 10 foot soft coated board and a red rash guard type shirt to identify you as a student. It’s a short instruction on land with the basics for paddling out, where to stand on the board and practice on rising up to a standing position. Then they hit the water for the real thing. Rachel the instructor held the back of the board the first couple of times to get everyone the feel of catching a wave. A couple of wobbly rides and our daughter was standing up, grinning ear to ear! 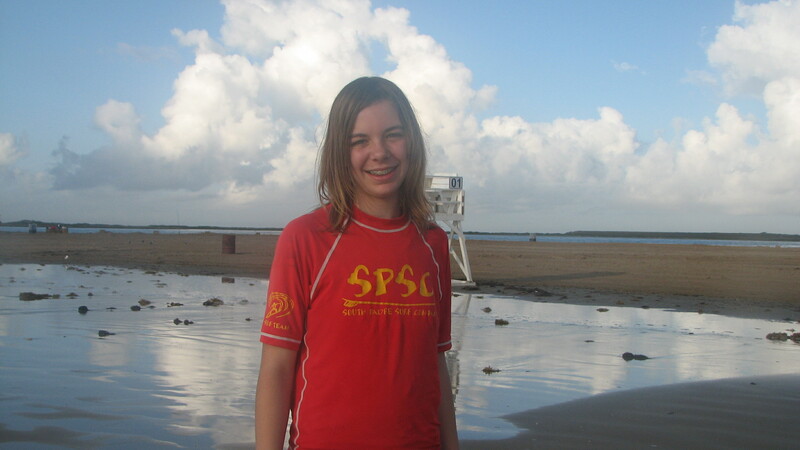 The first thing she said when she took a break on shore was that she wants a surf board. The child was hooked! 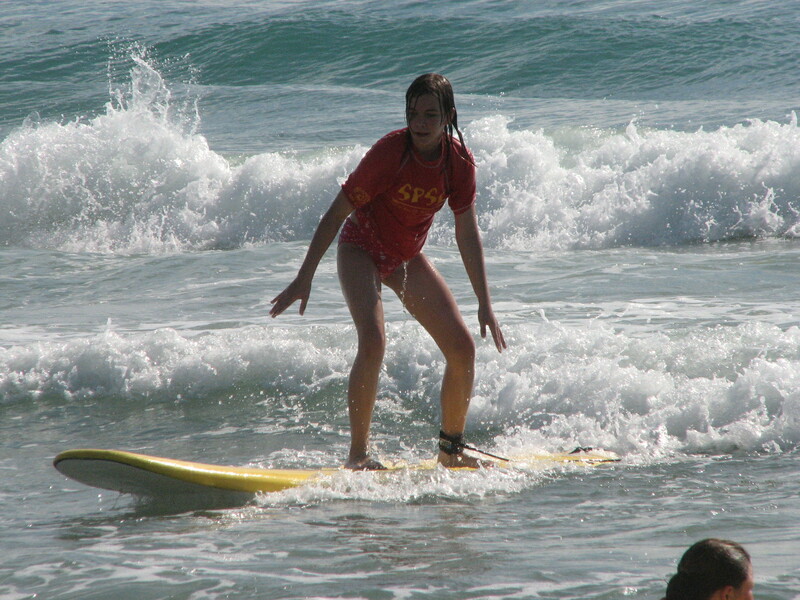 She spent the next 2 ½ hours riding the waves in, playing with another girl in the class and sitting on her board like the local teenagers were doing. We would laugh because she didn’t like to wipe out in the water so she would ride her board close to shore and just hop off into ankle deep water. Then she turned around and drag the board back out again to catch her next wave. 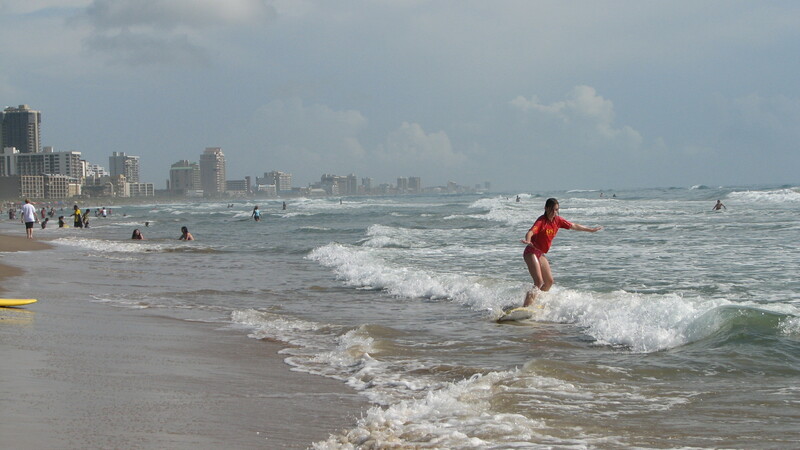 The next time we are down near South Padre Island we will definitely be contacting South Padre Surf Company either for another surf camp or to rent a board for the day! We took a girls trip to the Mall of America over spring break. I knew between shopping, eating and more shopping my daughter was going to want to ride at the Nick Universe in the middle of the mall. I did not really want to spend $31 for a day of unlimited rides or $5 a ride if we bought single tickets. This was looking like an expensive day and this was supposed to be a budget trip. I was reading reviews on Trip Advisor and someone mentioned getting a free wrist band. I was determined to dig out how they got in for free; I would love to get my child in for FREE!!!!! And then on the Nickelodeon Universe website I stumbled on how to get a free wristband. *Applies to new Nickelodeon Universe Rewards accounts opened after July 2, 2012. Must provide a valid mailing address and email to receive credits. 350 credits will be added to your Rewards account 3 business days after registration. Only one Nickelodeon Universe Rewards account per household. Bingo!!!!! I didn’t know if it would work but I had nothing to lose but a little time. http://nickelodeonuniverse.com/tickets/rewards/ So I signed up for the rewards program and heard nothing. In fact I had signed up 2 months before our trip and figured it was a lost cause. I was going to have to pay for her rides for a day. It didn’t make sense to buy it per ride; she was going to want to go over and over. Then a week before we left I got Nickelodeon mail, it was our rewards card!!!!! I checked our balance online and I had the 350 points. You redeem this card by going to guest services and also showing your driver’s license to match the address on the card. But even if you are going with multiple children it’s nice to get 1 of them a free wristband! It worked like a charm and my daughter went crazy riding the coasters. She even snuck in a few quick rides on the Pepsi Orange Streak before the mall closed. Saving $32 was well worth the time it took me to sign up for the free rewards program!!!! When it gets too hot, I get off the beach. My goal is to avoid frying my family so we head off the sand to get some shade and some lunch. Saturday’s beach break was to Sea Turtle Inc. Each person in our family picks the one thing they want to see/do/visit/eat or whatever and we do our best to make it happen. Sea Turtle Inc was my pick for this trip. Sea Turtle Inc is open 10-4 Tue thru Sunday and closed on Mondays. It’s a $3 donation per person to visit and when we went it was pretty busy. But I think busy is a good thing for them; it means the word is getting out about their work! And it was really hot at 3pm on a Saturday, so that might have helped increase visitors. 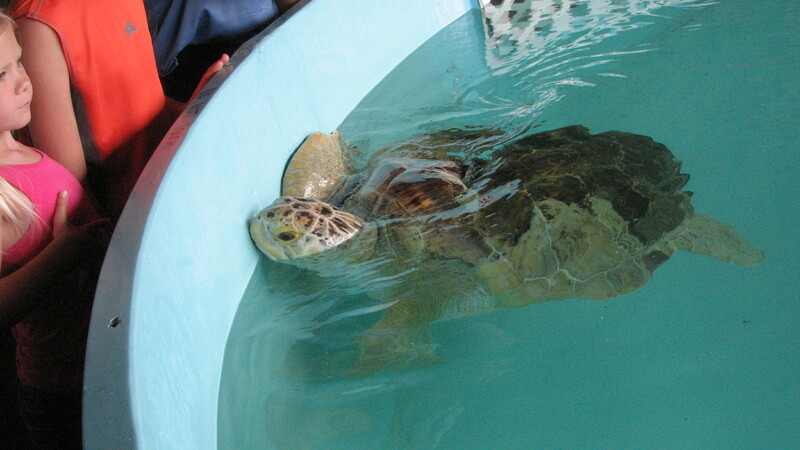 Inside the hospital are large tanks filled with the different sea turtles. There are Loggerheads, Greens, and Kemp’s Ridleys. The smaller Kemp’s are my favorite kind. The turtles are kept at the hospital until they are well enough to be released, but sadly some will never be able to live in the wild. The tanks are large and spread out a bit so it was never too crowded to check out the turtles. And there were lots of volunteers answering questions and explaining about some of the resident turtles. In the summer the turtle nests are released after hatching and often those releases are open to the public in the early morning. 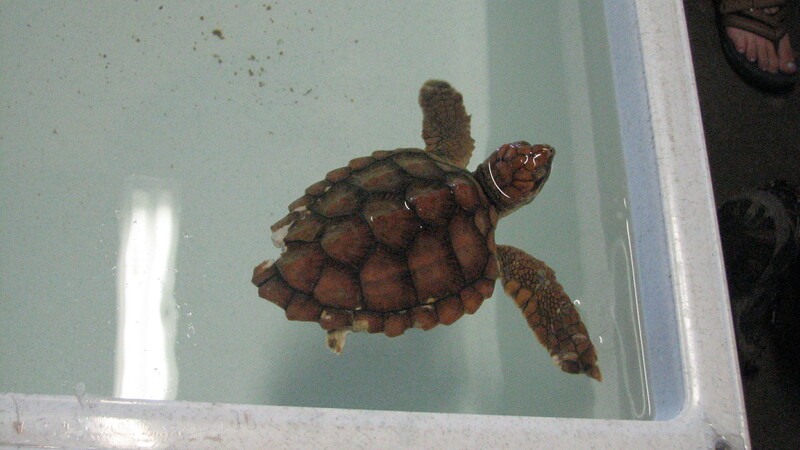 We were really hoping to catch a release on our visit but we were about 2 weeks too early for this year’s hatchlings. I think seeing a release would be incredible, where else can you do that? They even have a live camera if you want to check them out at http://www.seaturtleinc.org/sea-turtles-live/ We were even able to see a poor turtle have a sharks hook removed from his mouth during our visit. 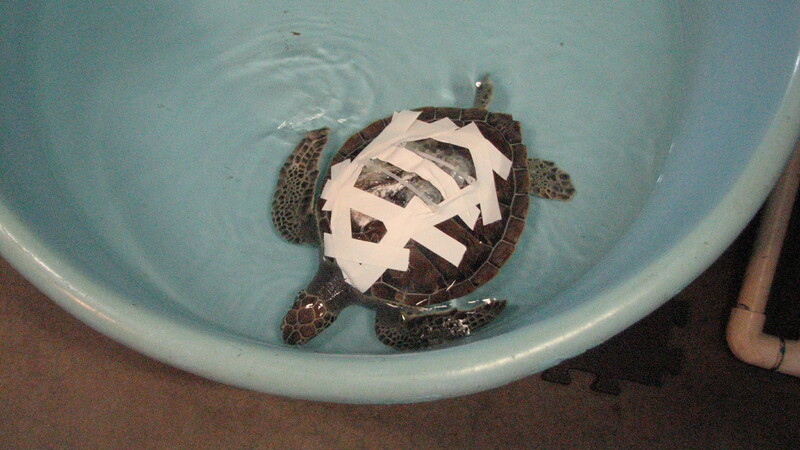 Another turtle was getting his shell fixed up with zip ties and tape. The work they do is amazing! From their website ” Start planning your next 2-night stay and earn 10,000 bonus Gold Points. Start by filling out the registration form below and then stay two or more consecutive nights anytime between May 13 and July 21, 2013 at any of our more than 1,000 participating Carlson Rezidor hotels worldwide to earn 10,000 bonus Points for each eligible stay. That’s in addition to the standard 20 Gold Points earned per U.S. dollar spent on every eligible stay! And remember, every eligible stay at a participating Carlson Rezidor hotel brings you one step closer to free nights faster – starting at only 9,000 points with no blackout dates on standard rooms. I do not currently plan to be in a Radisson, Country Inn and Suites or Park Inn for 2 nghts in a row. But you never know when travel might pop up. Register at the link below and then stay June 1- July 31, 2013 and on your second stay start to earn double miles. (Seems like a lot of programs are jumping on this bandwagon!) Or if you stay at a Staybridge Suites or Candlewood Suites you will start to earn double with your first stay. I always sign up for these promos. Sometimes travel pops up and I don’t have to think about if I am registered. Wyndham Rewards has started a summer promo for double points with your second stay at their hotels. This is for stays June 21 – September 13, 2013. You need to register on the Wyndham rewards website but this includes chains like Super 8, Microtel, Baymont, Days Inn, Ramada, Travelodge and others. Also they are throwing in a free Shutterfly book coupon at check-in. When it gets hot in the afternoon we head off the beach for some shade. 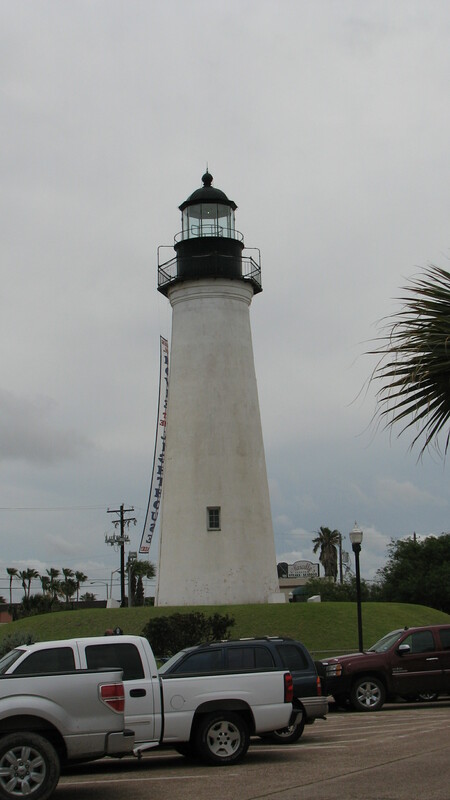 One day we did a quick run across the causeway to Port Isabel for our break. After a great lunch at Joe’s Oyster Bar we walked around the lighthouse and pier area. The little town area by the water is small but very picturesque with the Lighthouse. This is a great place to spend the afternoon either as adults or with the family. First the parking is free and we had no problem finding a spot to park close by. That is a huge plus for me, I hate to pay to park and I hate to look for parking spaces. We parked right next to the Lighthouse but chose not to tour it on this trip. There are cute little shops that line the 2 blocks for shopping or browsing. The Pirates pier square for dining and ice cream. Also the Dolphin Research and Sea Life Center is on the same block. We did not eat at Pirates Pier, if you know my husband you know we ate at Joe’s every day. (He really liked the place and I have NEVER seen him be so excited about a restaurant to visit it daily.) At Pirates Pier there is a courtyard to the right before you enter the pier area that has artisans and parrots. Also the world’s largest fly fishing pole and pirate statues dot the area. We walked out on the fishing pier to see if anyone was having any luck. Watched a fire eater perform and saw the pirate cannon fired off the pier before the pirate cruise left. Just around the corner we found the Sea Life Center entrance, it was $3 a person to visit. In large tanks in the middle were puffer fish and rays. A center worker held up the puffer fish and let the kids quickly touch it, a first for my daughter. 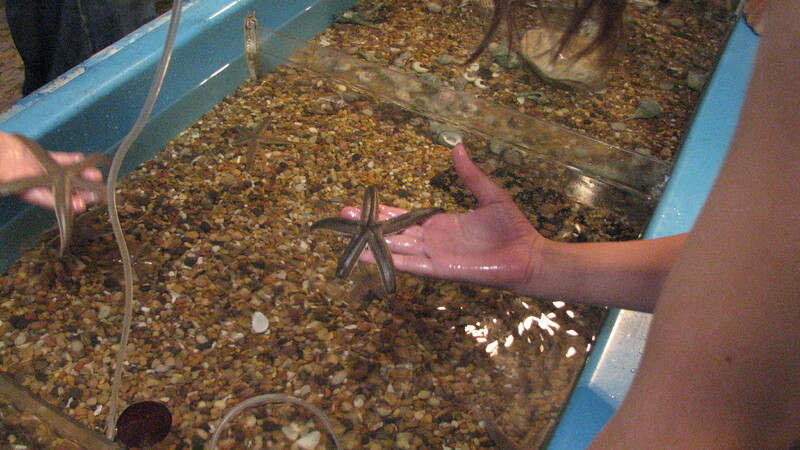 Other touch tanks held crabs and starfish. It was not overly crowded and it was easy to access the tanks. They had aquariums full of local fish, sea horses and a turtle to view. My child loves touch tanks so this easily took over an hour to visit and my husband seemed happy to view the local fish tanks. On Friday nights in the summer they show free movies on the side of the lighthouse. We had planned to view Madagascar 3 during our trip but a thunderstorm canceled the movie for the night. We don’t eat out very often unless we are on vacation. But when we do I like to check out http://www.restaurant.com You can search by zip code to see what is offered in your area. Right now a place we really like in our area has been added so I am excited to go back to Joe’s. The Restaurant.com certificates are for sale for amounts ranging from $10-50, and there is a minimum spend. For Joes it’s a purchase of $22.50 to use the $15 certificate. The price is $6 for a $15 off certificate, but I purchase when I have a discount code. Use code SUMMER to pay $2 for a $10 certificate or $3 for a $15 certificate. (And shop thru your miles earning portal.) Yup, order over $22.50 in food, get $15 off by spending $3. Works for me! I also check Restaurant.com for areas we are traveling to, we tried a great Mexican place in Seattle for about half off. (Remember to tip on the full amount of your bill.) Print off your Restaurant.com certificate and present it before you get your bill. 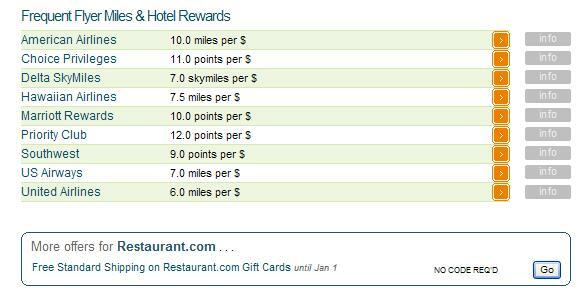 Here are the points payouts, going thru American you would get an additional 30 miles while saving on dinner. Why not earn points while shopping? #5 Using online shopping to earn airline or hotel points. I think I now do the majority of my shopping online. Aside from groceries I can get shoes, clothes, gifts, and anything else shipped to my house. And often it’s easier to just have it sitting outside my door 3 days later than driving around trying to find what I need. 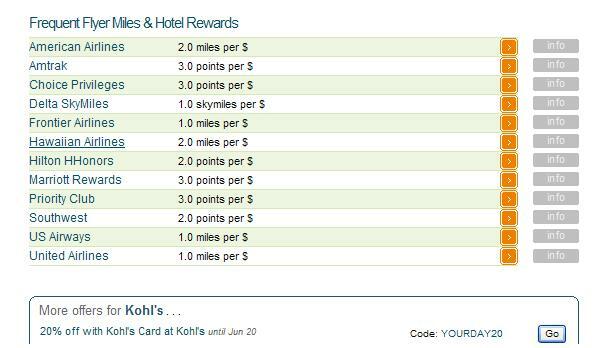 When I shop online I first click thru the website that gives me the most points/miles for my dollar. To do so I use http://evreward.com I enter the site name I am shopping it and evreward tells me who gives me the most back. I used Kohl’s as an example here and see the following points available. I usually go for airline miles UNLESS a hotel has a huge promo going. If Marriott is giving 15 points per $ I might go for them. If I chose to go with American Airlines I click on the info link and it will take me to the American Airlines portal. I click thru Kohl’s on their site and I am earning miles on my purchase. It takes an extra minute or two. But over time the miles add up. Earn a free Marriott night! On our recent trip to Texas I picked up a free Marriott night. Yup, taking one vacation while earning for the next one! To get your free Marriott night, go to Marriott rewards and create your account. Set your earnings to Marriott points, not airline rewards to get your free night. Once your account is made go to My Account, and in the drop down select Promotion Central. Pick the one that says Marriott Rewards Unexpected Bonus. Click on it to register and you are set to go. 2 stays are NOT 2 nights in the same hotel. You need to either visit 2 hotels or stay 2 different dates in the same hotel. So while in Texas we stayed twice at the Fairfield Inn in Weslaco. It was $72 a night with the AAA rate plus tax. Staying on Thursday and Sunday got us a future free night. I use Kayak to price hotels in the area and unless there is a huge price difference I go with the one giving me the best reward. Either in earned free nights or extra points. This promo is limited to 2 free nights per account but since it goes until September 2 I might have time to get the 2nd free night. This type of promo works very well if you are on a car trip or moving around vacation destinations.